An inspiring memoir about how the seemingly ordinary act of writing thank you notes led a middle-aged man out of hopelessness and into the fulfillment of lifelong dreams. At age 53, John Kralik was about to begin the new year at a personal nadir—confronted with a law firm in the red, a painful divorce, increasingly distant children, a small and poorly heated apartment, and a newly ex-girlfriend. During a walk in the hills on New Year’s Day, Kralik was struck by the belief that his life might be at least a bit tolerable if he could find a way to be grateful for what he had—and his inspiring thank-you-note story began. One by one, day after day, on plain note cards and with unadorned sincerity, he thanked close loved ones for gifts or kindnesses, he thanked business associates and former business associates, he thanked store clerks and a handyman, college friends and current foes—each with a brief handwritten note. The benefits that quickly began to come his way—from financial gain to companionship to inner peace—surprised him. And turned his life around. 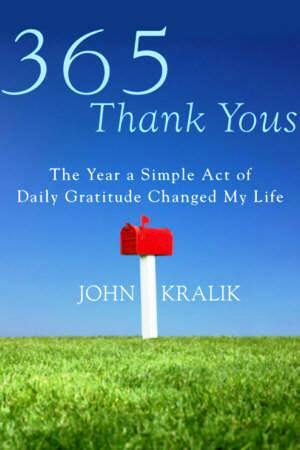 By the time John wrote his 365th thank you note, he’d lost weight, his business was prospering, his children were well and he’d grown closer to them, he’d reconnected with dear friends, his girlfriend had returned—and there were other positive changes in his life, even more profound and surprising.